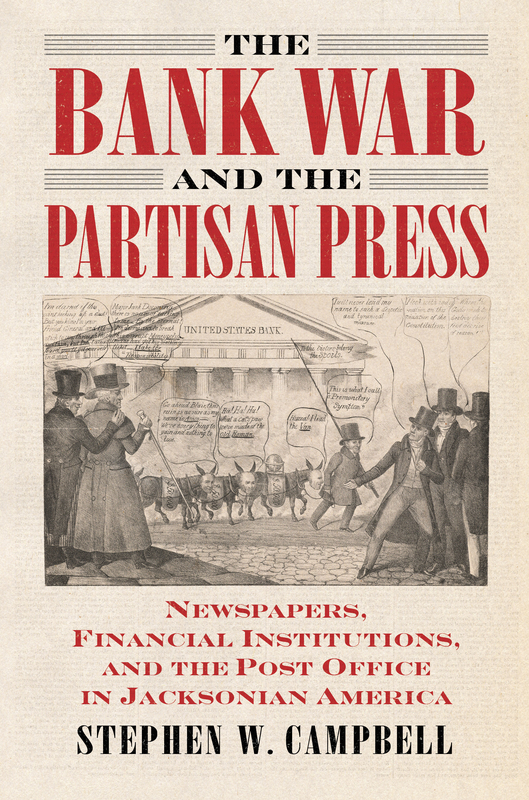 Drawing on insights from the fields of political history, the history of journalism, and financial history, The Bank War and the Partisan Press brings to light a revolving cast of newspaper editors, financiers, and postal workers who appropriated the financial resources of preexisting political institutions—and even created new ones—to enrich themselves and further their careers. The bank propagated favorable media and tracked public opinion through its system of branch offices while the Jacksonians did the same by harnessing the patronage networks of the Post Office. Campbell’s work contextualizes the Bank War within larger political and economic developments at the national and international levels. Its focus on the newspaper business documents the transition from a seemingly simple question of renewing the bank’s charter to a multisided, nationwide sensation that sorted the US public into ideologically polarized political parties. In doing so, The Bank War and the Partisan Press shows how the conflict played out on the ground level in various states—in riots, duels, raucous public meetings, politically orchestrated bank runs, arson, and assassination attempts. The resulting narrative moves beyond the traditional boxing match between Jackson and bank president Nicholas Biddle, balancing political institutions with individual actors, and business practices with party attitudes. Stephen W. Campbell is a lecturer in the History Department at Cal Poly Pomona.